Till 28 Feb 2017 Gong Cha: Celebrate Valentine’s Day with Forever Love Ban Ban Cup! 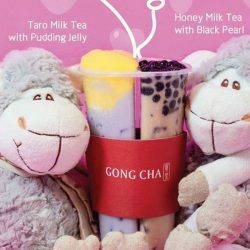 Add a touch of sweet to your Valentine’s Day with @Gongcha’s Forever Lover BB Cup (伴伴 ) consisting of Taro Milk Tea with Pudding Jelly and Honey Milk Tea with Black Pearl! Available now till 28 Feb at $5.20 per cup! T&Cs apply. 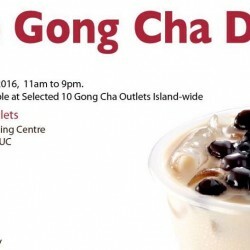 Gong Cha: Opening Promo – 1-for-1 Drink at Bugis Downtown Line MRT Station Outlet! New Gong Cha outlet at Bugis Downtown Line MRT Station is open now! Enjoy a Gong Cha drink at only S$1 when you pay with your UOB Card on your mobile with Apple Pay or UOB Mighty! Offer is valid from 5 to 9 December 2016 at 57 selected Gong Cha outlets. 28 Oct - 6 Nov 2016 Philips TV Singapore: FREE Gong Cha for all FB Fans! FREE Gong Cha bubble milk tea with pearl for all Philips TV Singapore fans! Unbelievable giveaway! Share it with your family and friends now! To redeem a FREE bubble milk tea with pearl is easy, just visit any Gong Cha Singapore outlet between 28 Oct 2016 - 6 Nov 2016 and show the staff you've liked Philips TV Singapore Facebook Page on your phone. 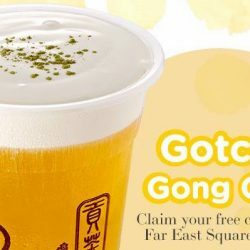 Enjoy Gong Cha at their newest outlet at JCube(#03-13)! The first 100 people to spot their new outlet will get a FREE cup of GCM Brown Sugar Black Tea! 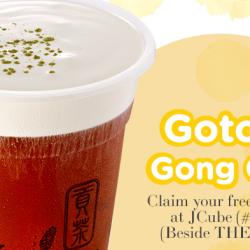 Just LIKE Gong Cha's Facebook/Instagram page and show the page to the cashier to redeem your free drink! While stocks last. See you at the new store! 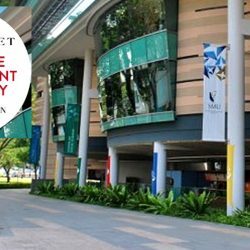 Singapore Management University students rejoice! A new Gong Cha outlet is opening at the School of Economics/School of Social Sciences (#01-71, opposite YMCA Orchard) from 1 August! Look out for the free Gong Cha on that day too! 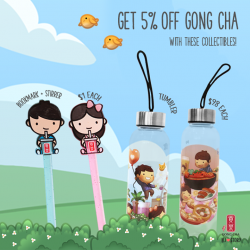 For a limited time only, these exclusive HJ Story collectibles are available at Gong Cha - get a cute bookmark/stirrer (2 designs, $1 each) or a handy tumbler (2 designs, $9.80 each) and get 5% off your drink order! Available at all Gong Cha stores (except NUS). 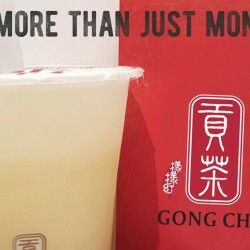 Gong Cha: 100 FREE Cups of GCM Alisan Tea at Far East Square Outlet! 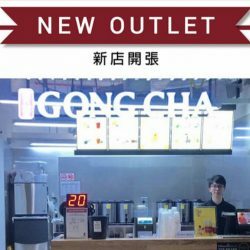 Gong Cha is now closer to you with their newest outlet at Far East Square (#01-02)! The first 100 people to spot their new outlet will get a FREE cup of GCM Alisan Tea!! 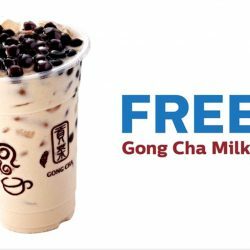 Just LIKE Gong Cha's Facebook/Instagram page and show the page to the cashier to redeem your free drink. While stocks last. See you at the new store! Enjoy a Gong Cha Milk Tea with Pearl Jelly at only S$1 when you pay with your UOB Card on your mobile with Apple Pay! Offer is valid from 25 to 29 May 2016 at selected Gong Cha outlets. Gong Cha has opened in Cathay Cineleisure Orchard! Head down and get a FREE Cranberry Black Tea, while stocks last. Dun miss your FREE Gong Cha Drink starting from tomorrow (1 Apr 2016) to 15 Apr 2016 at 10 participating Gong Cha outlets! Simply download FINDAPRO app and register! 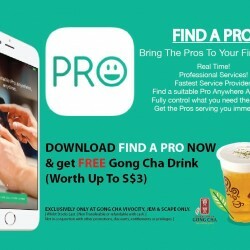 Download 'Find A Pro' App (For App Store only, free) today & redeem a FREE Gong Cha Drink (worth up to $3) on 5 and 6 March 2016. Exclusively at VivoCity, JEM & SCAPE Gong Cha outlets only. T&Cs Apply. Creative Ang Bao content this year! Give more than just money! Surprise your love ones with a Get a Hint Card , doodled with your well wishes and 2 Free Choice of Drinks for each of them! Grab it whilst stocks last at all Gong Cha outlets except NUS, Sentosa outlets & Royal Gong Cha Cafe. 1. LIKE or FOLLOW them on Facebook or Instagram. 2. SPOT Gong Cha New Outlet at Waterway Point or Clementi Mall. 3. 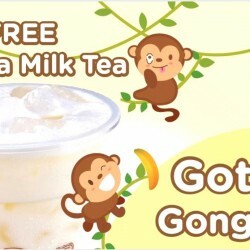 Flash Gong Cha Singapore Facebook or Instagram Page at the cashier to redeem a cup of Free Banana Milk Tea. Whilst Stocks Last. Quick Share this with your Friends & Loved Ones! 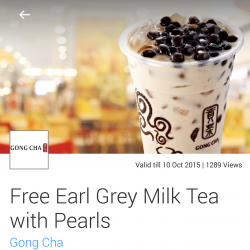 10, 11, 17, 18 Oct 2015 Gong Cha: Free Earl Grey Milk Tea with Pearls for Samsung Galaxy Life Users While stocks last! Users of Samsung Galaxy Life app, you are in luck! 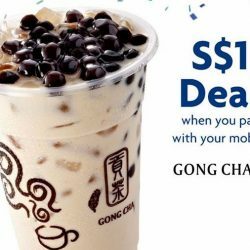 Gong Cha is giving out a Free Earl Grey Milk Tea with Pearls as a special thank you treat exclusively for Samsung Galaxy Life users! Head down to any Gong Cha outlet near you to redeem on 10, 11, 17 and 18 October 2015! Available on a first come first served basis, while stocks last! Enjoy all Filial Gong Cha Supporters! You & your Brave Daddy deserve a treat on the 20th & 21st June 2015! 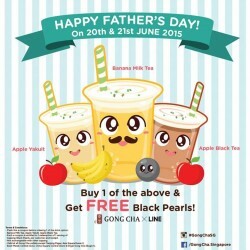 Buy Banana Milk Tea, Apple Black Tea or Apple Yakult and get 1 Free Serving of Black Pearls! Simply, flash the following e-coupon at our participating Gong Cha outlets s0 hurry grab the great deals Today! 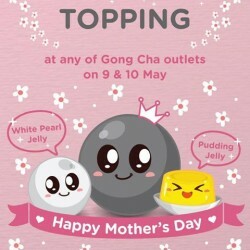 Get 1 Free Topping @ Gong Cha. Simply ADD US on Gong Cha Singapore Official LINE Account & stand a chance to win attractive prizes (in collaboration with LINE) ! Grab it fast! *Psst` you'll be given a set of specially designed LINE Stickers on the LINE too. 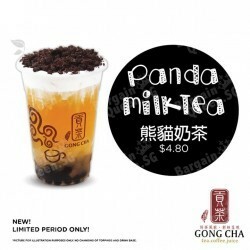 Gong Cha offers New Panda MilkTea at $4.80 for limited period only.